The Resources section is where important Resources that all users need to access are available from. The My Resources section provides users with access to any Resources or information that their organisation or sport has developed for them . To access a resource, click on the "My Resources" button on the Home Page. The resources that are available on your specific software site will be different from those shown in this example. The actual Resources are shown in black and when you mouse over them, you can select to View/Add Comments which are relevant to other users, or Download the file. The number of downloads and comments about each specific Resource also appears. You can add comments about any Resource simply by clicking on the "View/Add Comments" button that appears when you hold your mouse over a Resource on the My Resources Page (as shown in the image in the previous step). 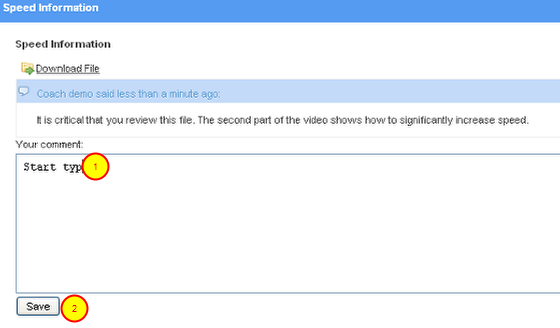 In the example here, the View/Add Comment link was clicked for the Speed Information Resource. A list of all comments and who entered the comment is also shown. The comments will be updated and anyone with access to that Resource will be able to see your comment. 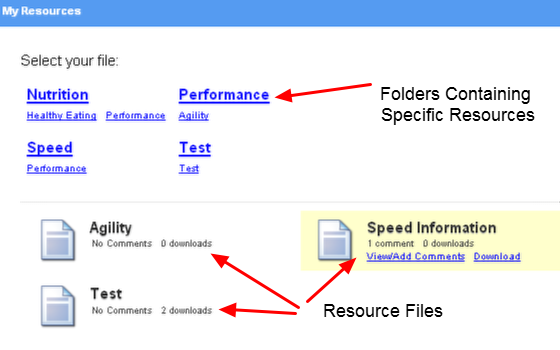 To Download a Resource, simply click on the blue "Download" link on the Resources Page. N.B. If an error message appears, see the "Allowing Pop Ups" step at the end of this section. Select to "Open with" or "Save File"? Users will need to select if they want to Open the document with existing software available on their computer, or Save it to their computer via their internet browser Downloads. 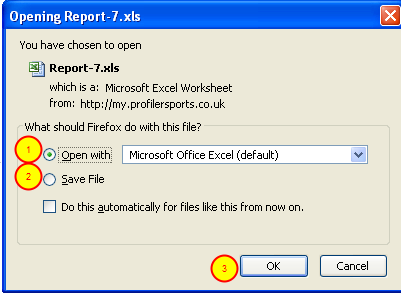 In the example here, the Speed Resource is a .xls document, so the software has already selected to open the .xls file using the Microsoft Office Excel software that reads xls files. Alternatively, if the file was a .png or a .flv then the software would use the existing image, or video software to open the file. If a user wanted to use different software to open the file, they would select the Other and then choose the programme as shown in the image in the "Open with chosen software" step below. If a user selects to save the file, it will be saved to the Downloads List (as shown in the next Step). Your computer will automatically try and open the file using the correct programme. However, you can select to choose a different software programme. 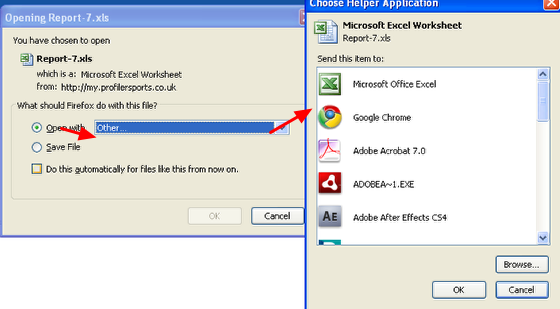 If a user selected to open the file with an "Other" file a Choose Helper Application selection box appears. Select the application/software program that you want to use to open the file (as shown in the image here). Then click the "OK" button. If you chose to save the file by clicking the selection box beside Save File in the previous image. The file will then be downloaded to the "Downloads" list on the users internet browser. The Downloads list usually pops up as soon as the file is finished downloading. 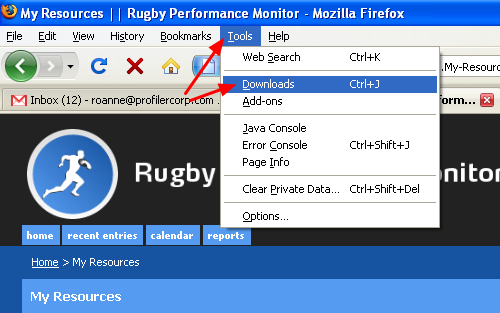 If it does not appear, users can access the Downloads list by clicking on the "Tools" menu and then selecting "Downloads" (as shown here). The file will appear in the Downloads List. Click on the file name, and then click Open. When the file opens, a user can save it to their computer. #1: If a message about the download being blocked appears because of a "pop up", don't worry. #2: Click on the "Options" button on the top right of the web page. #3: Select the "Allow pop-ups for my.profilersports.com" or Allow pop-ups for my.smartabase.com". Then click download again and the document will download and be available to open or save.